Ballad is a pleasure to hold. Measuring 1.2 x 5.5 x 7 inches, the book is both tiny and thick. The hardcover binding immediately gives a tactile pleasure to the reader with its textured surface. The pleasures continue with print-block like illustrations soaked in neon colors and accentuated with dot colorations. “This story is about a child who goes home from school along the same toad every day and how his small world suddenly becomes enormous. A variety of characters including a witch, a stranger, bandits, an elf and a queen are sprinkled through the pages. They encounter volcanos, omens, sandstorms and more! As the story builds, readers will find themselves flipping back to previous pages to seek the pattern of the story-telling and the unfolding of the chaos. 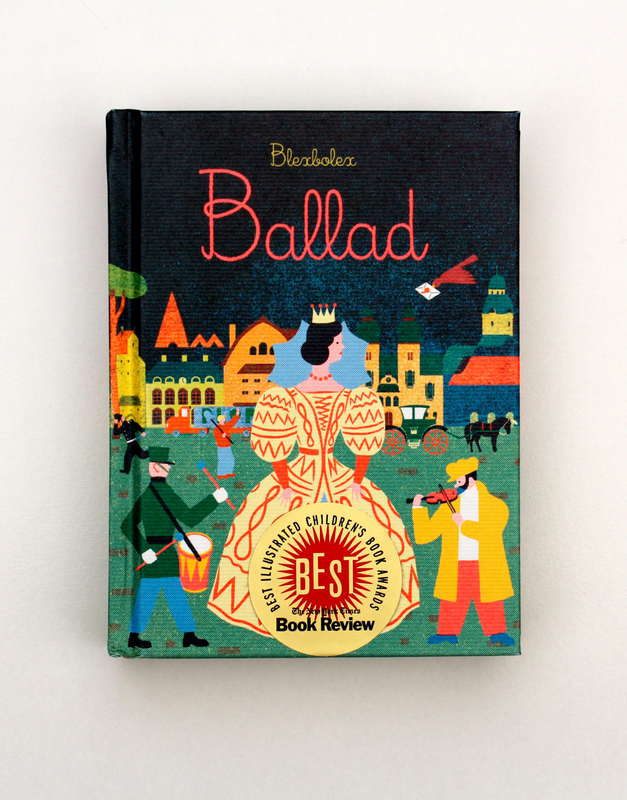 Difficult to classify, Ballad has been considered a graphic novel, a picture book and a children’s fiction novel. Although there is nothing offensive for children, the sophistication of design, and story-telling technique makes the book a more likely candidate for adults to enjoy. Written and illustrated by French author Blexbolex, the images and words are perfectly married with a cursive typography created by Patrick Doan.